I didn’t know Bridget Klecker, but I wholeheartedly connected with her San Francisco spirit. San Francisco was her magical place. She thrived living in the Haight, in the Outer Sunset, attending street fests, always willing to talk to local bloggers — and in sports — rooting in the stands for the Giants to score another victory. She came here as a young girl in her 20’s, working at Tower Records and making friends at every turn. Twenty years later her business became gourmet food and working for Google where many there are remembering Bridget fondly. How she could lose her life so tragically as an innocent bystander in a senseless hit & run during a police chase that got out of hand is beyond reason. 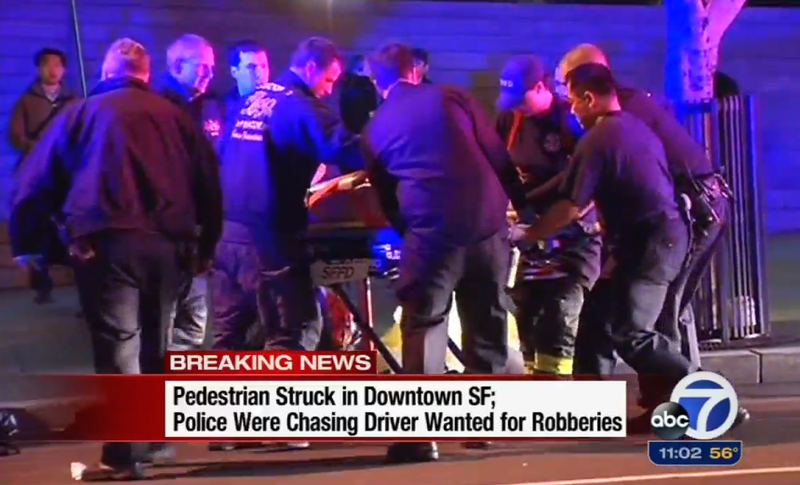 On Friday night as she was strolling back to her car in the Financial District, she had no way of knowing criminals would come barreling through the crosswalk. When I look at this photo of paramedics and police poring over her I can see the horror yet compassion in their expression as they look down at this beautiful young woman still fighting for her last breath. Bridget Klecker — who loved baseball and World Series victories — was remembered by about 30 friends on Sunday as they lay flowers and shared stories at the site of the tragic incident at the corner of Kearny and California. The SF Giants put out a tweet offering condolences to her family, and the call out over social media is growing that she be recognized at Monday’s home opener. Good night sweet Bridget. We can only hope your killers will soon be caught and that justice will be served.